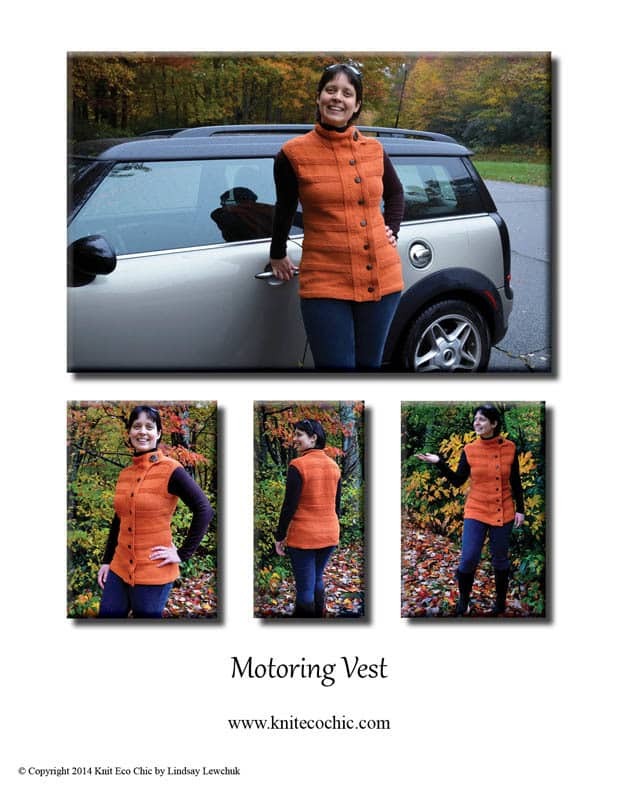 Motoring Vest, inspired by a photo of a sensationally dressed woman modeling beside a Triumph Twin 500 Motorcycle in 1951, updates the modish style in this figure flattering knitted vest. Garter sections and shaping highlight specific points on the body creating a flattering hourglass figure. A wide button band draws the eye up and down the hourglass, lengthening the body. A mock turtle cowl is accented with a larger button off set from the vertical panel. 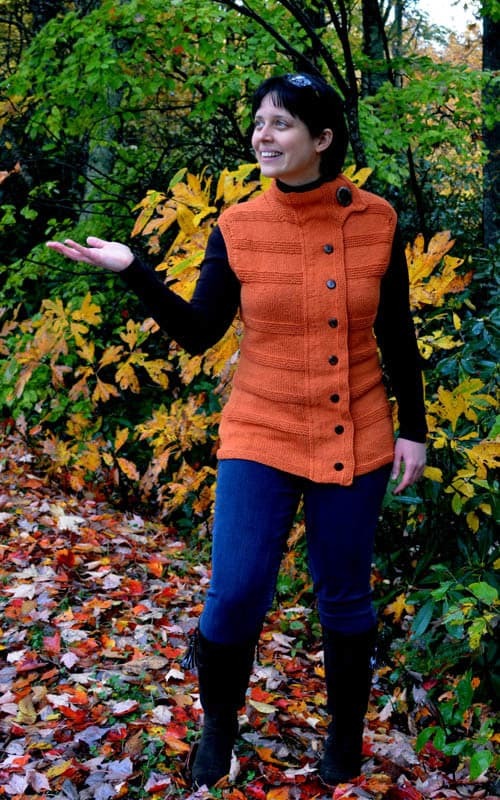 Knit in two pieces – the body is worked flat seamlessly (joined at the shoulders) and the button band, which is seamed on at the very end. Arm and neck edging finishes the piece. The tech edited pattern includes written directions and schematics. Bust: 32.75”/ 83.5cm (35.25”/ 89.5cm, 36.75”/ 93.5cm, 39.25”/ 99.5cm, 40.75”/ 103.5cm, 43.25”/ 109.5cm, 44.75”/ 114cm, 47.25”/ 120cm, 48.75”/ 124cm, 51.25”/ 130cm, 52.75”/ 134cm, 55.25”/ 140cm). Length: 24.5”/ 62cm (25.25”/ 64cm, 25.25”/ 64cm, 25.5”/ 65cm, 25.75”/ 65.5cm, 26.25”/ 66.5cm, 26.5”/ 67.5cm, 26.75”/ 68cm, 27”/ 68.5cm, 27.25”/ 69cm, 27.5”/ 70cm, 27.75”/ 70.5cm). 20 sts and 32 rows over 4”/ 10cm in St st. 20 sts and 40 rows over 4”/ 10cm in Garter st.
Make sure to wash and dry your swatch according to how you plan on drying your garment to ensure accurate gauge swatch. Organic cotton has unique drape and reactions to washing and drying! If substituting yarn, make sure the substituted finished gauge matches the organic cotton finished gauges. The garment has positive ease from hips through underarms. The garment is worked seamlessly in order not to disrupt the Garter rows. Larger sizes may want to substitute circular needles, even though it is not worked in the round, to accommodate the number of stitches. 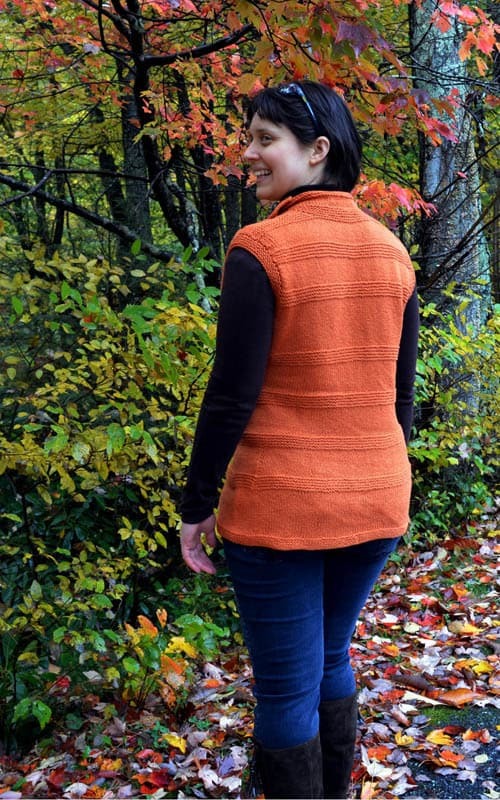 The Garter repeat is a set row repeat of 10 rows, while the St st sections vary to make the garment the appropriate length. The Garter sections are set at specific points to highlight curves. If adding or subtracting length in a specific area, make sure to do so in the appropriate St st sections in order to keep the Garter sections hitting at the hips, high hips, base of waist, top of waist, and under bust. To add or subtract length to the garment as a whole, add or subtract rows from the bottom St st section only. If adjusting the length, make sure to adjust the Horizontal Panel accordingly. The collar’s height is a mock turtle. 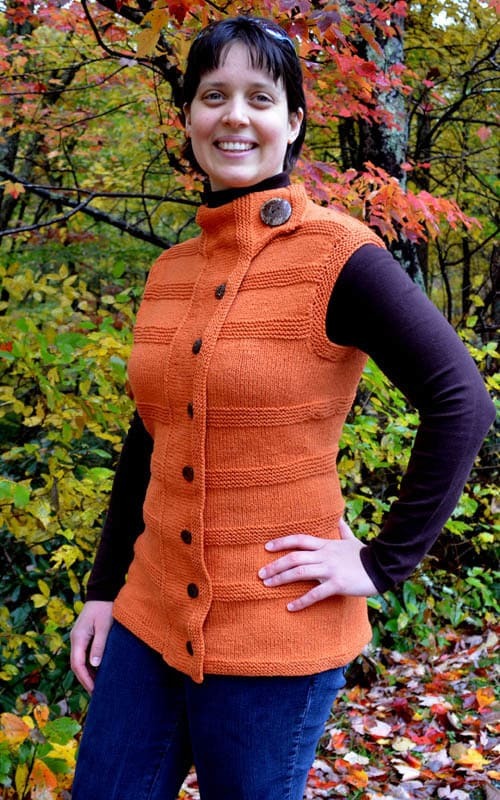 To increase or decrease the height of the collar, add or subtract rows to the St st section. If adjusting the height, make sure to adjust the Horizontal Panel accordingly. Quick reference working gauge schematic and finished gauge blocking schematic included.